Man Shot, Killed in Vegas Apartment Home Invasion. Negligent Security? A male victim was reportedly shot and killed in a Vegas Valley Drive apartment shooting Monday evening, December 11, 2017. 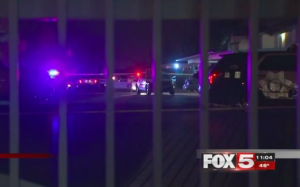 According to The Las Vegas Review-Journal, the shooting occurred at an apartment complex in the “4600 block of Vegas Valley Drive, near Nellis Boulevard,” shortly after 7:00 p.m.
FOX 5 reports, a gunman “began shooting from outside the apartment complex and forced his way into the victim’s unit” where a struggle ensued. The victim was transported to Sunrise Hospital and Medical Center, where he tragically succumbed to fatal injuries. A woman and 7-year-old child were apparently home at the time. Thankfully, media reports indicate they were physically unharmed. Did negligent security contribute to this senseless shooting? We represent individuals and families who have suffered a tragic loss or injury as a consequence of negligent property security. Read Our Legal Take below to find out if the victim’s family may have a legal avenue for justice and claims for substantial compensation in Nevada, or call now for a free consultation with our legal team: 888.842.1616.